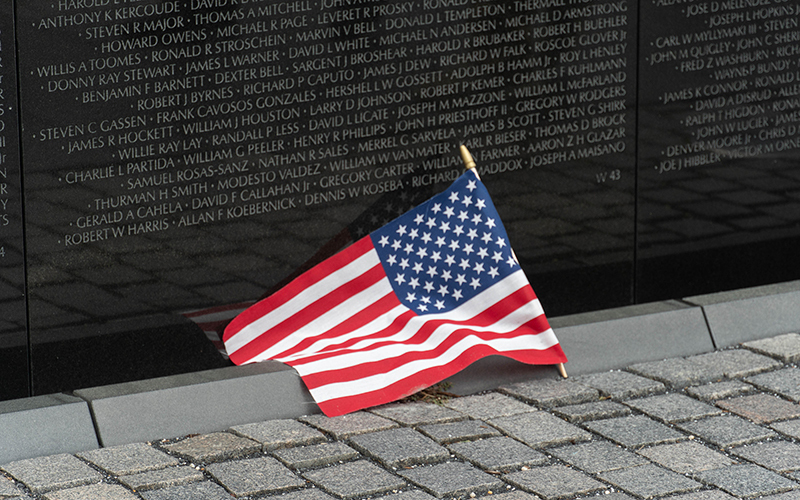 WASHINGTON – Applause is not often heard around the Vietnam Veterans Memorial, but that was the response Saturday from a few hundred people who came to see Cindy McCain place a wreath in honor of her husband, Sen. John McCain. 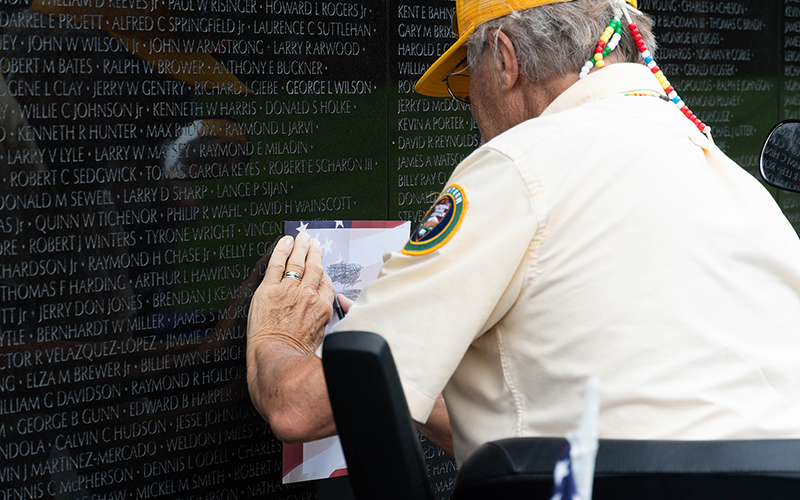 The wreath-laying was one of the last events in a week of celebrations of the late Arizona senator, who spent more than five years as a prisoner of war in North Vietnam. 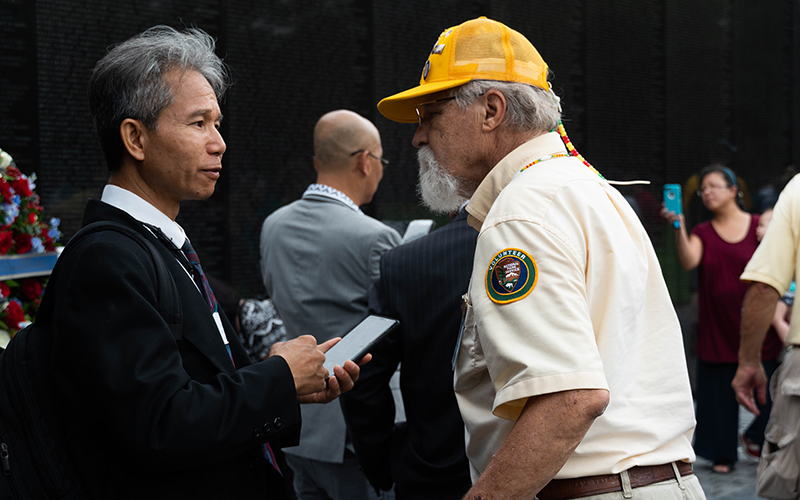 Those who turned out for the wreath-laying included graying veterans of that war and South Vietnamese refugees who credit McCain with helping them get out of their country, which was overrun by the North in April 1975. “We say thank you to all Americans who opened doors, arms and hearts for us. Thank you,” said Quyen Ngo, who was there with others who said they were children of Vietnamese political prisoners who were later helped to come to the U.S. The Saturday morning event was brief, literally a stop between the Capitol, where McCain lay in state, and Washington National Cathedral, where hundreds of political figures gathered for his funeral. Under a cloudy sky, Cindy McCain walked to the vertex of the black granite walls flanked by Defense Secretary James Mattis and White House Chief of Staff John Kelly, both former generals. A sailor helped her place the large wreath of red, white and blue flowers; McCain stood in front of it for a moment before walking away. 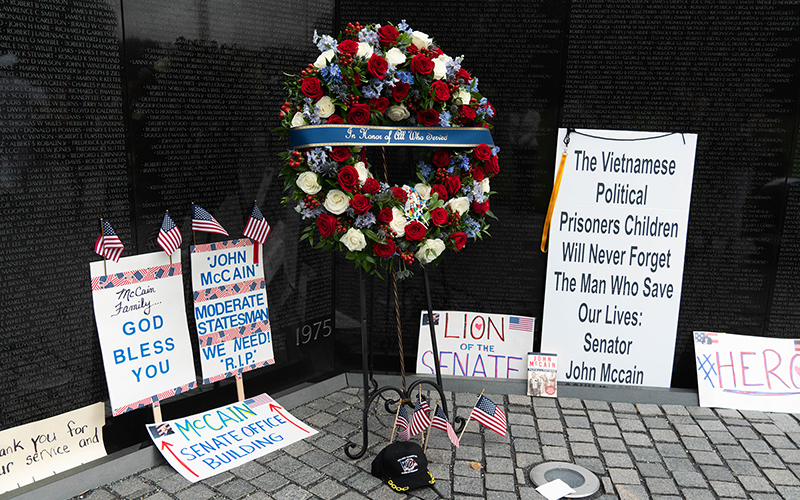 It was not long before other visitors began placing signs and notes honoring John McCain for his service as a soldier and a senator. Ngo, Vinh Ho and Thien Thauh Nguyen were among those who came up after McCain left and stood before the wreath. It was the second time in as many days that the three honored McCain, who died a week ago after a yearlong battle with brain cancer. The Vietnamese said they spent hours in line Friday to visit the senator as he lay in state in the Capitol Rotunda. “He literally campaigned for the Americans to save the lives of the South Vietnamese political (prisoners) and their families to come to the U.S., to be able to live here, to have freedom in America,” said Ho, a social worker in Philadelphia who traveled to Washington to honor McCain. That drew the attention of other visitors, including Paul Stancliff, 74, a Vietnam veteran and National Park Service volunteer who introduced himself to the three. They talked and took photos together before Ngo helped Stancliff back to his motorized scooter. Stancliff met his wife, Cindy Hollender-Stancliff, at the Wall. They have been volunteering with the National Park Service for decades and try to help veterans who may be suffering from post-traumatic stress to overcome their fears when they visit the wall. But Stancliff said they were at the Wall today specifically to pay respect to McCain. Although he believes the word “hero” is overused, Stancliff said he thinks McCain was one for always putting the country first.